The winding road along Vietnam's coastline connecting the country's important cities and towns has borne witness to many twists and turns in her recent history. Built in the 18th century by Vietnamese foot soldiers and mandarins, it was called mandarin route. From the hectic traffic and fast business pace of Hochiminh City to pristine beaches in Phan Thiet. Nha Trang, Danang...and historical sites in Qui Nhon, Hoi An, Hue and Hanoi, the mandarin route will be with you wherever you go. You will set foot on a maiden expanse of land between Dong Hoi and Ninh Binh where you wil find the local people and landscape exotic beyond your imagination. Sixteen days of travelling along this backbone route will give you an opportunity to tell your friends that "I have been there and have learnt about Vietnam". Experience Vietnam’s highlights in just 14 days with flights between each city, enabling you to see as much as you can. 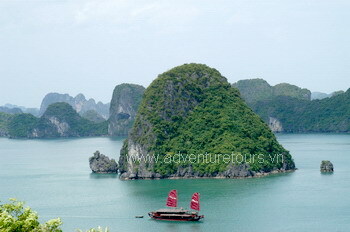 From Hanoi to magnificent Halong Bay, before flying to the ancient capital of Hue. Chill out in Hoi An, a charming old fishing town with fascinating architecture and laid back atmosphere. End your holiday absorbing the bright lights of Saigon and venturing into the heart of the Mekong Delta. Essential Vietnam is a wonderful trip designed for those who want to experience the very best of Vietnam, but only have limited time. Brings you the charm of Hanoi, the scenic impressive sights of Halong Bay, the ancient capital of Hue, the charming Hoi An, the vibrant Ho Chi Minh City and the mighty Mekong Delta. Discover some beautiful Vietnamese sites ( Hanoi, Hoabinh, Halong, Haiphong, Danang, Nhatrang, Phanthiet and HoChiMinh) followed by 5 days of relaxation in NhaTrang and Phanthiet , a seaside resort in the south of the country.You will travel by airplaine and air-conditioned vehicles and with of a local tour guide during the trip. This new set tour is ideal for travelers whose time is limited but still want to have a panorama of the diversity and the majestic beauty of Vietnam. Departing from Hanoi. arrive into the Imperial city of Hue and explore the ancient Citadel, tombs and pagodas of this peaceful, leafy town, then journey to Danang and walk the sands of the renowned China Beach. Visit the ancient Cham ruins of My Son en route to Hoi An, where you will find a quaint, beautifully preserved UNESCO heritage listed town, with a mixture of Chinese, Japanese & European influences evident in the town’s historic old quarter. This unique journey through Vietnam links the fascinating cities of Hanoi and Ho Chi Minh with the breathtaking countryside of the central highlands. Our cycle routes take us into rural landscapes with emerald green rice paddies and remote villages.